Cake: Grease the baking pan. Beat eggs and sweet condensed milk until fluffy. 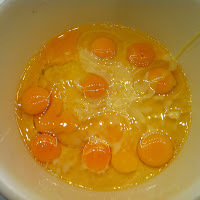 Add flour, baking powder, oil and salt, stir briefly and fill into the mold. Bake at 175 °C for 60 min, test with a skewer. Draw the bears heads on two sheets of baking paper, I used this template from the page with the original recipe. However, the ears of my bears turned out significantly smaller, so next time I would pipe them a bit bigger. 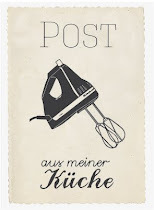 Put the baking paper on a baking tray or the work surface with the painted side facing down. 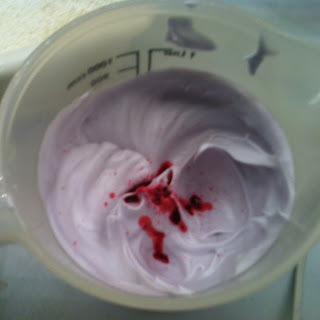 Beat the egg whites until stiff, gradually adding the sugar and then the elderberry syrup or food coloring. 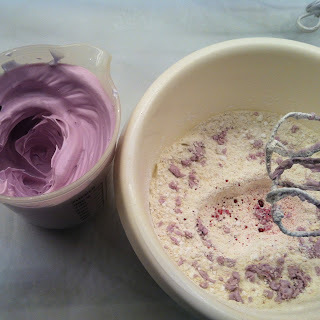 The color of the egg whites should be strong, because the powdered sugar will be added afterwards and make the color lighter. Turn the colored egg whites onto powdered sugar and almonds and gently mix. Do the 10-second test: When a solid line drawn with a spatula has disappeared into the batter after 10 seconds, the consistency is right. 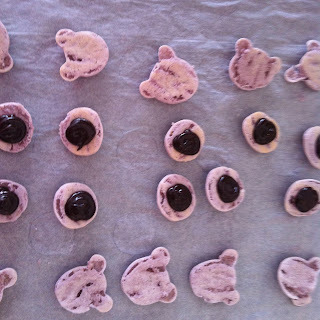 Fill the mixture into a piping bag with a large tip and pipe the teddy bear heads. In the original recipe, they say to wait a few minutes before piping the ears, so that a smooth skin forms on the head part and the macaron does not run, a problem I had with my snowman macarons. 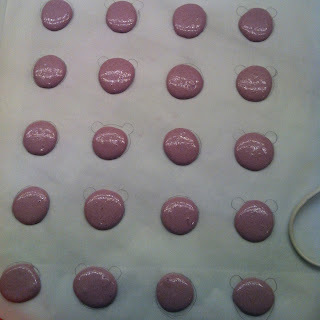 This time, the macarons were not runny, but quite a few had cracks! I probably could have let them dry longer, but it was about 20 minutes. Well, I continue to try! Break the chocolate into pieces, boil the cream, remove it from heat and add the chocolate, stir until smooth and let cool. fill the macarons, fitting the pairs together. Let the macarons dry a bit. Put the white chocolate into a plastic bag and melt it in a water bath or in the microwave at 50%. Cut the end of the bad open. Pipe a small dab of melted white chocolate on each bear face and let it dry again. 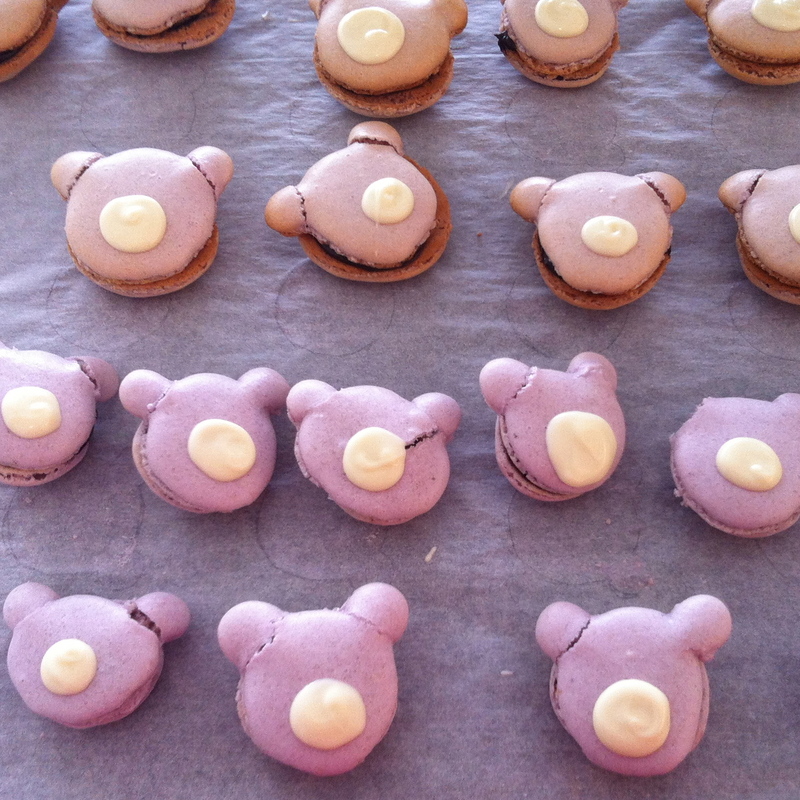 Here you can see that the bears in the background spent a little too much time in the oven ... but luckily enough, the recipe yielded more than 2 trays, more than 20 bear macarons! 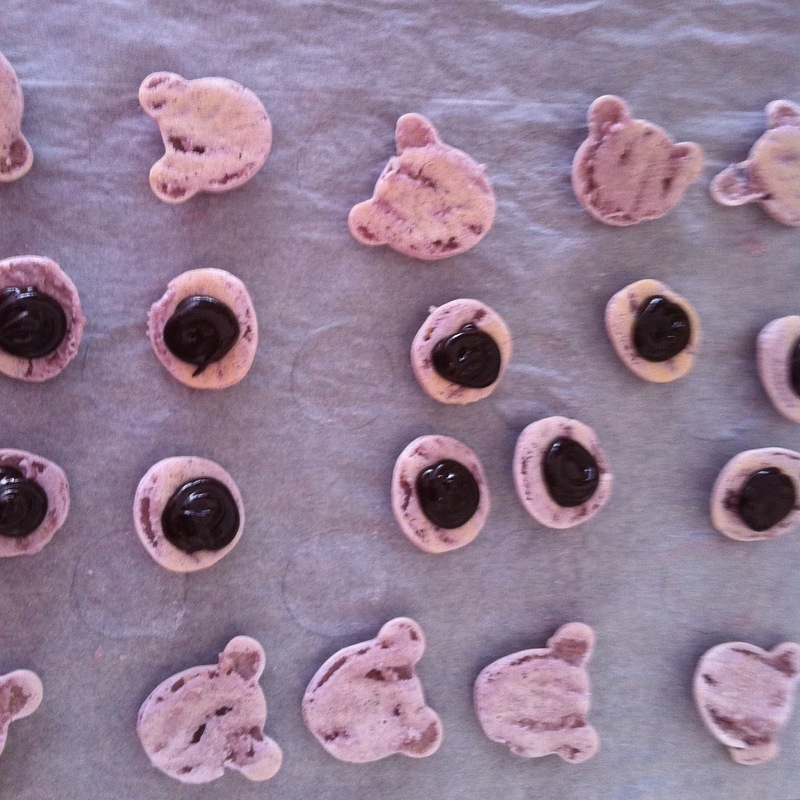 Paint eyes, nose and mouth with black food coloring onto the finished bears macarons. 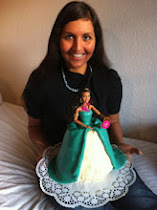 With the remaining ganache, decorate the cake and let it dry a bit. Set the bear macarons onto the cake, maybe fix them in place with small dots of ganache.